I covered New Zealand from Cape Rienga (Northern most tip) to Bluff (Southern most tip), in about 8000 km over 25 days. Driving in New Zealand was exciting, adventurous, breathtaking and high focus! I’ll lay out the facts right away. It was the most amazing journey of my life, I mean there is no other way to explore New Zealand except drive all over yourself! New Zealand is full of points, places, lakes, rivers, mountains, views, greens and just plain gorgeousness every few kilometers and hence having your own vehicle is super helpful cause you can stop anywhere and take as much time to immerse yourself. But its not all fun.. Driving is a privilege.. not a right! I had taken a Toyota Hiace Campervan. If you have been reading my blogs you would know I’m not the most luxury loving traveller. I infact love keeping it simple and the more of the local exposure I can get… the better my experience and stories have been. So when it came to choosing a Campervan, I involved a friend and his wife who stay in Auckland to help out and guide. Let me first explain a Campervan. All inside the back of your driving vehicle! – You can pick up your campervans directly from airports and also leave them close by. Most companies provide pick up and drop to airports as well. Here’s what I did… being off-season, I was already getting huge discounts.. almost 50%. Now the most popular company for campervan is a company called Jucy. You just can’t miss them if you are in New Zealand. They have the bright green campervans with a lot of branding! Now what happens is.. when Jucy has sucked the life out of its vans and used them and abused them for many many years, they hand down their vans to their sister concern called Lucky! Lucky then strips down all color from the exterior and interior of these van and rent these white and very grey vans out for almost 1/4th the price. Hello! I love white and grey! She was minimalistic, sturdy, had miles on her which gave her character and just cried a little when going uphill! I loved her from the moment I met her. So if a campervan could have costed me over $100 per day, I actually got it for about $30 which was obviously a BLESSING! 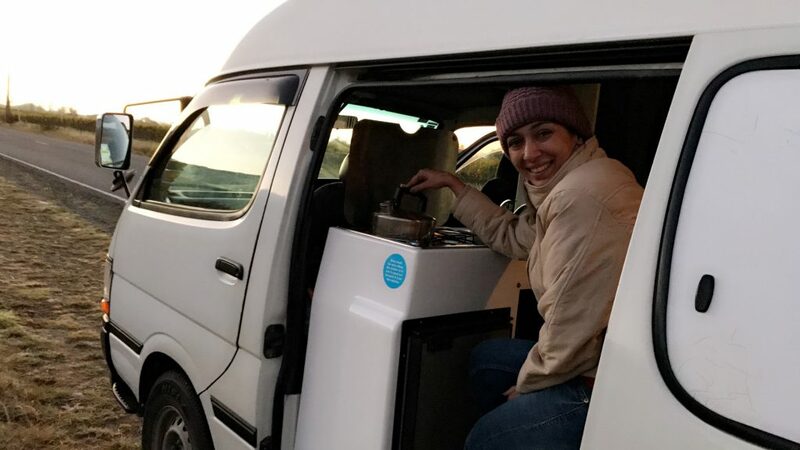 So here I was in my own Campervan, ready to explore the country on my own and make a van a home for a month and ready for her to teach me so much! But first let’s quickly cover Driving Rules. 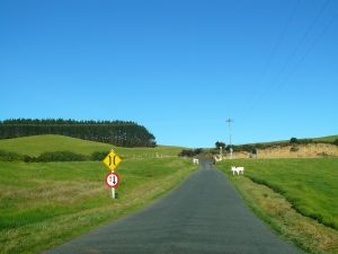 Driving is a Delight in New Zealand! That’s cause I’m a total walk the line and obey the rules kinda gal! haha! Really! Every country has traffic rules, but then it just depends on the citizens and how much they respect those rules. Coming from India, and having driven only in India before, handling the left hand drive came easy.. but I had to completely let go of the ‘Chalta hai’ / ‘no one’s watching’ attitude. Let me give you some perspective. New Zealand is mostly mountainous, and everyone follows road rules even in the most obscure parts of the country. They drive at high speeds assuming that so does everyone else. One has to remember and remind oneself that you are an outsider/visitor in their land… you must obey the home rules.. they are MEANT for everyone’s security including your own! You know most of these rules.. just follow them without exceptions and here’s some more of them..
– Seat Belts are a MUST! – Speed limits: You can drive upto a 100 km/hr on highways and outside the cities. While approaching a city, town or any residential area, drop your speed to 70km/hr and always stay at 40km/hr in residential areas. The speed limits are clearly marked on roads so if you are attentive you just can’t miss them, They are painted on the road as well as sign posted on the road sides. Your GPS also pings you to remind you of the speed limit in the concurrent area. – Joining Main Roads: Most of the roads you will drive while exploring will be outside cities, which means no signals. Every joining road is marked with the SOLID White or Yellow line. White solid means stop for atleast 2 seconds before you join the main road if it is clear, but a yellow line means HARD STOP. It means even if you cant see any approaching traffic, you have to hard stop before you join the main road. Vehicles are flying on the main roads at high speeds, a hard stop is always located where you may miss some vehicle coming so ensure you pause and check before you join. The fine for not hard stopping at yellow lines is $150 NZD. – Roundabouts: Common rule in every country and still just a reminder.. the vehicle on your right has right of road. So always stop and see and only if there is no car on your right.. join the roundabout. – Indicators: Yes.. you better get used to using them. You should indicate when… Changing lanes… taking turns. Please do not take this for granted and assume the people can figure it out.. they wont! You gotta tell / indicate to them. – Mountain driving: I loved New Zealand for this one.. so you can see the curvature of the roads on the hills on your GPS of-course.. however every … yes every curved road is marked with the advisable speed limit. I personally went 5KM/HR lower than recommended just cause I am cautious.. however even if you stick to the suggested you will do just fine! Dont be a fool to think you can out-smart the limit cause most of these roads are two lane roads and people really GO on their speeds within their lanes.. never crossing the line.. if you exceed the speed limit you WILL end up overshooting your lane and that may lead to catastrophes! So just dont please! Campervans are made higher to adjust to your being able to stand in them. Hence they can have a tendency to topple on steep turns. BEWARE! – Bridges: New Zealand is full of Bridges and most of them are single lane. All you have to do is remember the goat story and watch out for the CLEAR markings. They have painted every road approaching the single lane bridge in advance letting you know you are approaching one. A few meters before the bridge you will see a round signal with 2 arrows. The bigger one has the right to road.. If your direction is the bigger one.. drive right on if someone is not already there, however if you are the smaller arrow.. always pause before you go. Again! Always! Even if the car on the other side is still approaching.. it has the right of road and will be expecting you to wait. 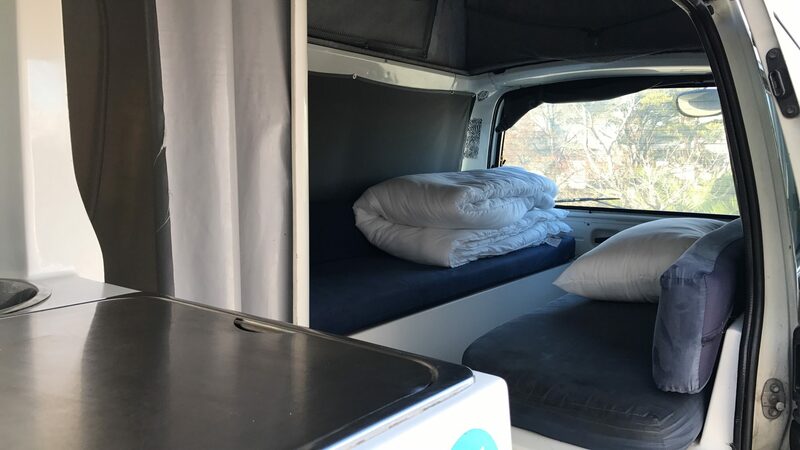 – Campervan sensibility: There will be lots of campervans everywhere you go, however it is important to remember that there will be terrians where you will be going slower than the limit, just cause you have a big van obviously. If you see cars lining up behind you, catch a patch where you can get off-road, give an indicator, slow down and move to the left allowing them to overtake you. Like I said that most roads are 2 lane and people always follow road rules. No one will overtake you unless you indicate you are ok with it and its clear for them to overtake. 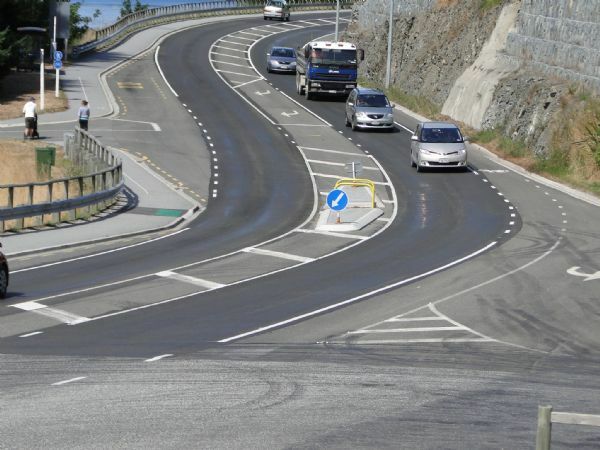 – Solid and Dotted lines on the road: If there is a solid line dividing the road, it just means you are NOT allowed to overtake on this road. Dotted means if its clear you can overtake. 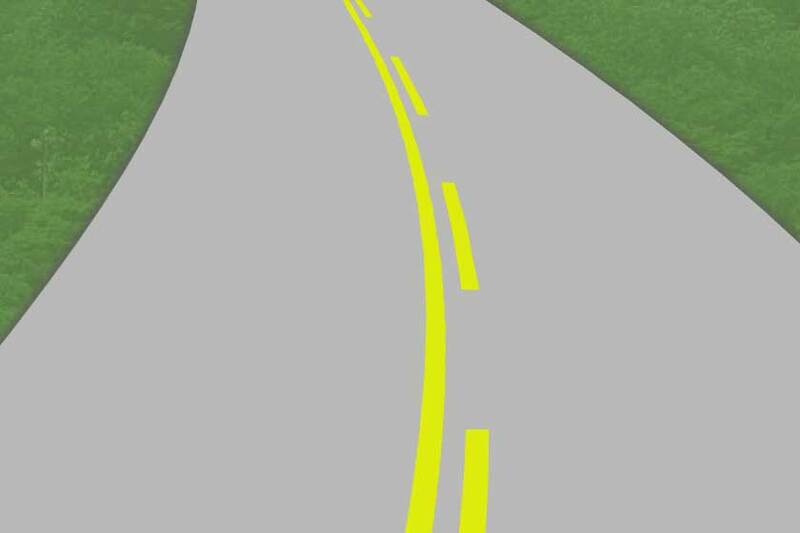 The roads which have both a dotted line and a solid line means the line on your side dictates your right. If the dotted line is on your side of the road you can overtake if it clear for you to and a solid line means the vehicles on the other side are allowed to so you should’nt even try. This is again why people will just keep following your campervan in a line until you allow them to pass you. – Hazard light: You must put these on when parked or planning to park so people behind you know you may sudden stop or take your time to find parking and stop so they should plan accordingly. The other use was my FAVVVV.. they use it to thank each other! So when you let people pass you by on highways, some of them with give you a flash of the blinkers to say thank you… I promise you it will give you a smile… for all the people I let overtake I got 8 blinkers and they felt very rewarding! – Passing Lanes: This was very new to me.. So since most of the roads are single lanes/two way the authorities make the Passing Lane areas and all of them are clearly marked as well. 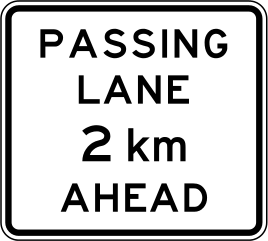 You will start seeing road signs 5 kms ahead that a Passing Lane is approaching. When in the Passing Lane, always start from being on the left as your campervan is slower than the smaller cars. Remember you are on a vacation and most behind you are from there, familiar with the roads and in a hurry. When you want to overtake, do it from the right.. indicate the lane change… accelerate.. overtake… and then indicate and come back to the left most side again. Even if you are the only one on the road.. obey the ‘Stay on the left’ rule.. speed as much as you are allowed but dont hog the right lane just cause you didnt see anyone cause the cars at higher speeds behind you will be expecting you to be on the left. – High Beams: I DO NOT recommend driving at night at all in NZ cause most roads are narrow, steep and without street lights. If you have to however; it is acceptable to drive on high beam on roads with no lights, however you MUST go Low Beam when you see any car approaching. You must also go Low Beam if there is a car close infront of you and follow his/her speed limit. – Honking! : Haha! Our favvv thing to do… is totally uncool here! Please do not honk or flash your high beam when you wanna overtake! Please! Flashing high beam in NZ means you are giving way or ‘You First’ and honking means you are abusing someone. And abusing is just not OK in a beautiful place like NZ. You wont hear a horn for days cause everyone is well behaved in this blessed country. New Zealanders can report your car to the authorities even if they ‘observe’ you not observing traffic rules.. BEWARE! Also, ensure you book Wayyyyyy in advance… there are a ton of travellers visiting this country! Here’s a funny story.. I just joined my driving classes here in Dubai, and went for my theory class yesterday. According to the rules here, you are supposed to switch your low beams and fog lights on in the event of fog, sandstorms and rain but never your hazard lights. The logic is sound.. hazard lights are for emergencies and an indication that the vehicle has stopped completely.. and if there is an emergency, the ambulance or cops will not be able to identify the vehicle in need if everyone has their hazard/ emergency lights on! In India, we put our hazard lights on all the time in rains and fog! My trainer then asked me… where are you from.. I said India.. he then asked have you seen people use hazard lights here during fog or rain.. I was really confused cause it’s true Dubai is very strict with driving rules and yet I REALLY had seen people use hazard lights here and ‘breaking that rule’ in Dubai! He mocked on saying cause most of the drivers here are from India, Pakistan and Bangaldesh who refuse to get this logic.. I felt made fun of and yet in complete agreement! Why is it that we Indians are such ‘Rebels without a cause’ towards driving rules. Why blame the authorities always.. Why only abide rules when being watched.. when we the educated class are so aware that the rules are MEANT for our protection and convenience.. why don’t we become the change instead of asking for a change and hoping someone will do it for us.. baby steps my lovelies.. baby steps.. just do your bit.. encourage people around you to not be jerks and do their bit and slowly we will outnumber the fools! 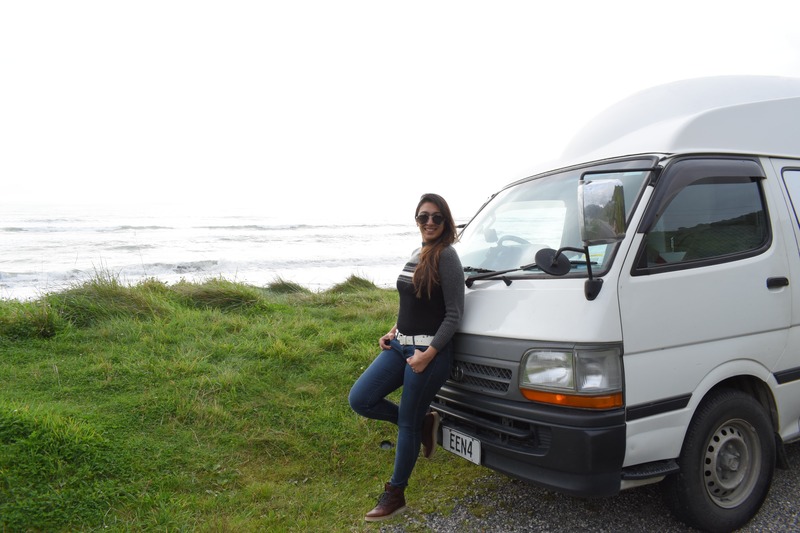 Blog and Vlog on Campervans and Camperlife coming soon! Hit Subscribe for prompt updates! Well captured Smriti….if I would have known you were visiting NZ would have got in touch with you (hope you remember me). It’s a beautiful place I call home now. Mesmerising the beauty and blessings at all times here in NZ.